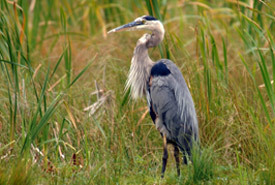 The great blue heron is the largest heron found in Canada. This colonial-nesting waterbird is characterized by its long neck, long legs and short tail, and a greyish-blue upper body with black and white markings on its crown and under parts. Measuring more than one metre in height, the great blue heron's stilt-like legs are essential for foraging in shallow waters where the birds feed on fishes and frogs. On land, great blue herons may hunt for salamanders, mice and large insects. There are currently five recognized subspecies of great blue herons. The subspecies present in Ontario is considered a short-distance migrant and can be found in many habitats, from southern wetlands to northern boreal forests, provided a nearby water source is present. What is this species' conservation status? In North America, the great blue heron is considered secure. 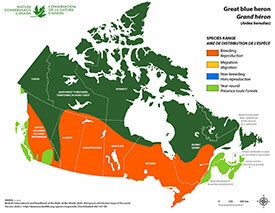 However, this does not mean that Ontario's great blue heron colonies are unthreatened. In fact, human beings are this bird's biggest threat. When nesting sites are disturbed by human activity, adult herons leave eggs and nestlings unguarded, making them vulnerable to predation by bald eagles and other predatory birds. 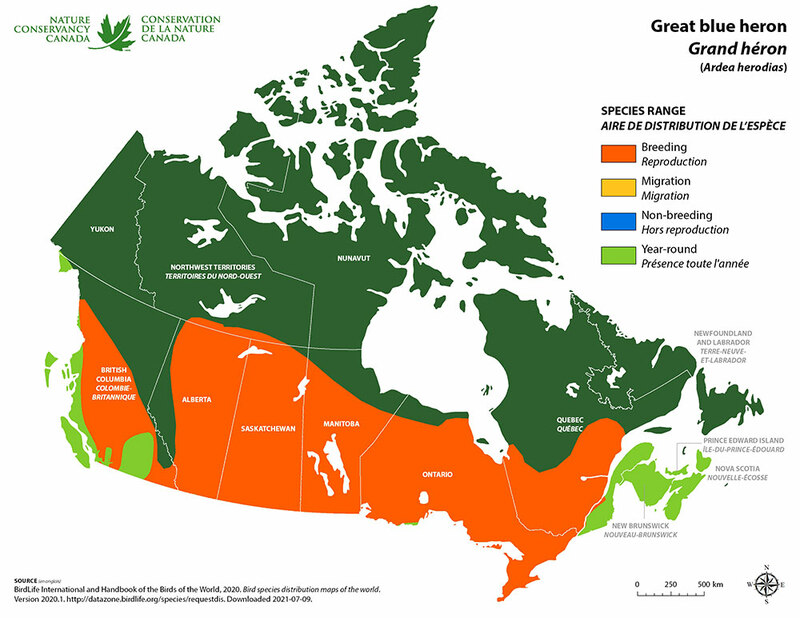 In addition, adequate nesting sites are becoming limited due to development in the province. Though not formally listed in the Species At Risk Act, protection of great blue heron habitat is critical to the survival of this majestic bird. In Ontario, the Minesing Wetlands provide ideal breeding grounds for great blue herons and are home to one of the largest and oldest known colonies in the province, with more than 200 active nests.